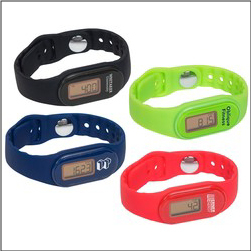 Order Custom printed Silicone Pedometers with a watch – these fitness trackers are ideal as a health and wellness promotional item. These stylish pedometers track steps, distance, calories burned, and active time, as well as watch mode. Easy to use. No additional software, apps, or smart phone devices required. Water resistant with easy to read LCD. Include free additional set of batteries. Several colors available. A very popular item with healthcare centers and workers.